So you may have read my 4 Easy Steps To Claim Your Business In Facebook Places, which is great if your place already exists in Facebook Places… right? I realized – duh, what if someone’s business, location, or “place”, doesn’t yet exist in Facebook Places? 1) Go to touch.facebook.com and login. 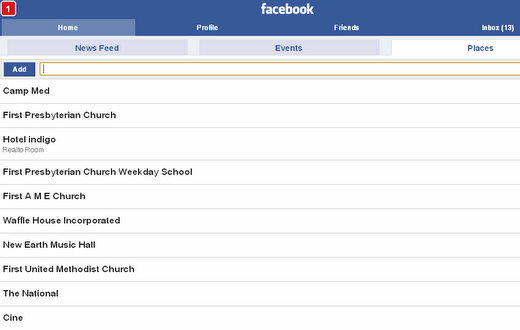 This is necessary for you to add a place to Facebook Places that is not already there. Once you’ve allowed Facebook to use your current location you’ll be presented with a search bar and a list of locations underneath that search bar. This tutorial is assuming that your place is not listed, which means it hasn’t been added to Facebook Places yet. So to add your location to Facebook Places, type in your location (business, location, church, etc…) using the name and exact spelling that you’d like to use for your Places location. ** side note – what you type here is important because once a new “place” is added, then a new Facebook page is added for that place and people will then be able to “Like” your new place. So make sure you’ve typed it out the way you want people to read it. Now that you’ve logged in to Facebook, allowed Facebook to use your location, you’ve clicked the “Places” tab, and typed in your location in the search / add bar, you are now ready to add your location. Now this part is EXTREMELY DIFFICULT, so beware!!!! Go ahead and click the “Add” button!!! Once you filled out your “Name” and “Description” fields go ahead and click “Add” in the lower right hand corner. And that’s it, you’ve just added a new location to the Facebook Places inventory. If the place you just added is a place you own, or you have the right to do this, then now it’s time to claim your Facebook Places location. Regardless of whether you own this new location, or a just a visitor, or whatever, nothing prevents you from “Like’ing” this new location. 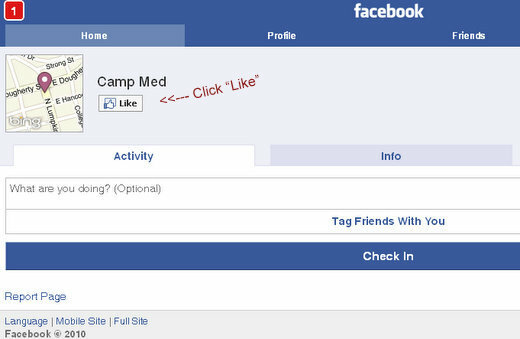 So go ahead and click “Like” to your new location to promote it to all of your friends on Facebook!